The Enhanced Wide-Band Micro-Miniature Tri-Axial Accelerometer Unit (EWB MicroTAU) system is a wireless, high-speed, synchronized data acquisition network for dynamic acceleration sensing, recording, and processing applications. The system includes EWB MicroTAU Remote Units, a Receiver Unit, and the Graphical User Interface (GUI). 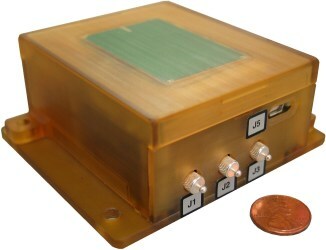 The EWB MicroTAU Remote Unit is a small, battery-powered, autonomous, wireless device designed for trigger initiated acquisition and recording of high-speed acceleration data. The unit acquires data from three external accelerometers, and can be pre-programmed for multiple acquisition events. The unit then autonomously follows the user-programmed schedule of events (e.g., sleep, triggering, data acquisition, and data processing). Within the schedule, the unit can follow dichotomous paths that are selected based on sensed events. Download and event setup commands are issued either wirelessly or through a standard USB connection from a Graphical User Interface running on a PC. The EWB MicroTAU system was designed for NASA to monitor the Shuttle Wing Leading Edge RCC panels during ascent and on-orbit phases for potentially damaging impacts from foam, ice, ablator, and metallic objects. This usage as a wing leading edge impact monitoring system was first used in NASA's Return to Flight mission, STS-114 in July 2005 and is slated for subsequent missions. It assists in detecting, locating, and characterizing the severity of impact event similar to the debris impact that caused the Columbia disaster. Internal Processing: RMS Signal Analysis, Frequency Analysis, Decimation, Peak Detection, et al. The EWB MicroTAU system has a sister system designed for strain gauge applications. Click here for more information about the WSGIS System. In 2003, NASA utilized the the predecessor of EWB MicroTAU to monitor a series of foam impact tests simulating the launch impact event on the Space Shuttle Columbia in early 2003. Click here for more information about this WB MicroTAU application. Click here for more information on the original MicroTAU™ system.